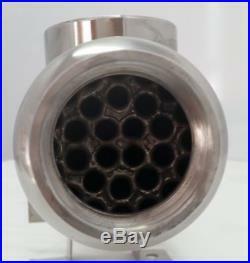 Stainless Steel Tube and Shell Opposite Side Ports for Pools/Spas 155,000 BTU. 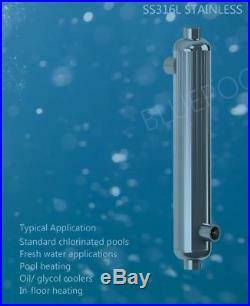 155,000 BTU Stainless Steel Tube and Shell Opposite Side Ports GPM Boiler Side 8.46 GPM Pool Side 62.66 Boiler Ports – 1″ NPT Pool Ports – 1 1/2″ NPT Diameter 2.99″ Length 17.71″ Number of Tubes – 30 PSI Drop Hot 1.10 PSI Drop Cold 1.58 Working Pressure – 80 PSI BTU rated with 180F Boiler and 80F Pool This unit is suitable for pools/spas that are 13,300 gallons. These heat exchangers are constructed with a stainless steel 316L shell and stainless steel 316L corrugated inner tubes to ensure high velocities inside the unit. 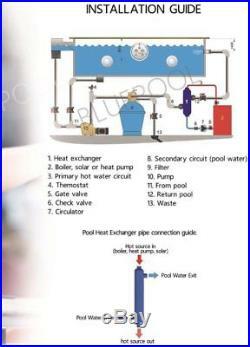 This is a very reliable, efficient and cost effective way to transfer heat indirectly between any boiler circuit and any pool or spa circuit. The units are designed for both horizontal and vertical mounting. 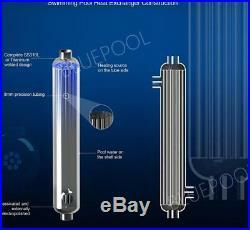 Port sizes: (to/from Boiler) 1″ – (to/from Pool) 1 1/2″. It is recommended to always install the unit with the mounting bracket (mounting brackets included with each unit) fixed to a wall, and/or ceiling or floor to prevent water hammer or vibrations which could damage the unit. 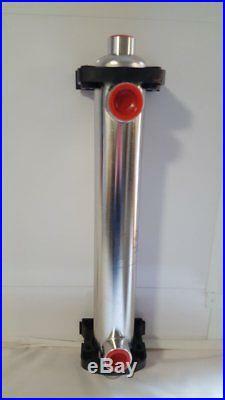 Always install the Stainless Steel Pool & Spa Heat Exchanger in a counter flow pattern. The units should be installed downstream of the filtration and pumping equipment. 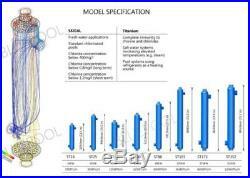 The boiler water must be assisted and the usual precautions taken to prevent air locks. The pool water pump should be controlled by a thermostat in the pool pipe work before the heat exchanger and set at the required temperature. Stainless Steel Pool and Spa Heat Exchangers are not suited for saline or salt water environments. For those applications please use one of our Titanium units. For occasional (holidays & weekends) use pools we recommend a 2x output multiplier to obtain a 2°F/hr heat up rate;2. Nominal values are based on 60°C temperature between incoming heating and heated water. Typical residential application: – Swimming pools, spas heating- Hot tube heating- Floor heating- Driveway snowmelts Typical industrial application: – Oil cooling or heating- Steam condenser- District heating- Transmission and engine cooler- Boiler sample cooler- Waste water heat recovery- Industry process applications IMPORTANT!! The following fluids are prohibited for use as a flushing agent for stainless steel pool and spa heat exchangers: Hydrochloric Acid up to 0.1% concentration Solutions the contain MCI Chlorides (MgCI2, NaCI between 0.01 – 1%, CuCI up to 1%, CaCI2 from 5% to saturation) Any fluid that will deposit alkaline residue or phosphorous It is the purchaser’s responsibility to ensure that all fluids in contact with the products are compatible with the construction material of the product, this includes operational fluids and cleaning fluids. Corrosive environments are often a combination of chemical levels, flow rates and temperatures. Failure to ensure this will result in damages to the product. 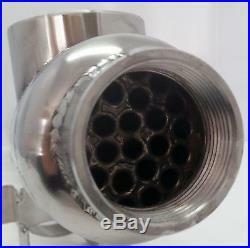 155,000 BTU Stainless Steel Tube and Shell. GPM Boiler Side 8.46. GPM Pool Side 62.66. Boiler Ports – 1 NPT. Pool Ports – 1 1/2 NPT. Number of Tubes – 30. PSI Drop Hot 1.10. PSI Drop Cold 1.58. Working Pressure – 80 PSI. BTU rated with 180F Boiler and 80F Pool. This unit is suitable for pools/spas that are 13,300 gallons. For occasional (holidays & weekends) use pools we recommend a 2x output multiplier to obtain a 2°F/hr heat up rate; 2. 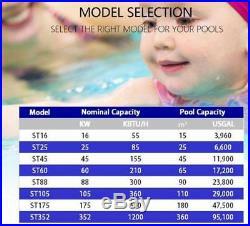 Swimming pools, spas heating – Hot tube heating – Floor heating – Driveway snowmelts. Oil cooling or heating – Steam condenser – District heating – Transmission and engine cooler – Boiler sample cooler – Waste water heat recovery – Industry process applications. The following fluids are prohibited for use as a flushing agent for stainless steel pool and spa heat exchangers. Hydrochloric Acid up to 0.1% concentration. Solutions the contain MCI. Chlorides (MgCI2, NaCI between 0.01 – 1%, CuCI up to 1%, CaCI2 from 5% to saturation). 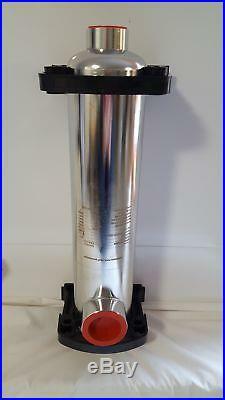 Any fluid that will deposit alkaline residue or phosphorous. It is the purchaser’s responsibility to ensure that all fluids in contact with the products are compatible with the construction material of the product, this includes operational fluids and cleaning fluids. Sorry, our items are NOT available for pick-up. No additional information at this time. You might also like. Certified Non Barrier 1′ – 100′ coil – BLUE PEX Tubing Htg/Plbg/Potable Water. Certified Non Barrier 1′ – 100′ coil – RED PEX Tubing Htg/Plbg/Potable Water. Certified Non Barrier 1′ – 1000′ coil – BLUE PEX Tubing Htg/PLbg/Potable Water. Certified Non Barrier 1′ – 1000′ coil – RED PEX Tubing Htg/PLbg/Potable Water. 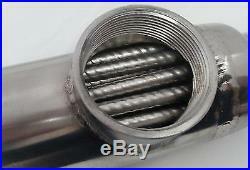 The item “Stainless Steel Tube and Shell Opposite Side Ports for Pools/Spas 155,000 BTU” is in sale since Friday, March 9, 2018. This item is in the category “Home & Garden\Yard, Garden & Outdoor Living\Pools & Spas\Pool Equipment & Parts\Pool Heaters & Solar Panels”. 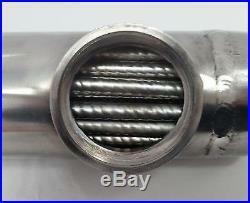 The seller is “badger-pipe” and is located in Mauston, Wisconsin. This item can be shipped to United States.